We know that plaques build up in the brain. This is STRONGLY related to gradual brain degeneration. When you sleep, your brain is cleaning itself. Keep reading below to understand how critical good sleep is to every aspect of your health, but especially brain health. 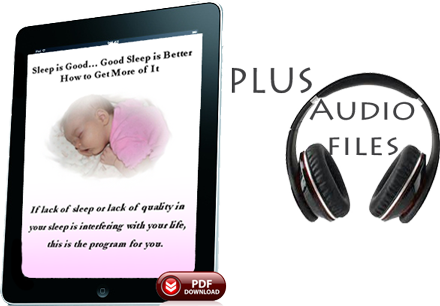 Once you have purchased the subscription to “Sleep is Good, Good Sleep is Better” or the more encompassing programs: the Healthy Brain program (HBp) or the full Tinnitus Synergy program, the Sleep program will be accessible on this page. …by the end of two weeks, the six-hour sleepers were as impaired as those who, in another Dinges study, had been sleep-deprived for 24 hours straight — the cognitive equivalent of being legally drunk. Even 14 days into the study, they said sleepiness was not affecting them. In fact, their performance was terrible. What this means, is that if you are sleep-deprived, you are, by definition, a lousy judge of our own sleep needs. Have you heard that sleep is important for your brain health? If sleep is cut short, the body doesn’t have time to complete all of the phases needed for muscle repair, memory consolidation and release of hormones regulating growth and appetite. Then we wake up less prepared to concentrate, make decisions, or engage fully in school and social activities. In recent years, we have learned the exact structure of waste product that build up in Alzheimer’s disease. The breakdown of the brain’s automatic clearance system may be the cause of neurodegenerative (nerve degeneration) disorders such as Alzheimer’s, Parkinson’s, and Huntington’s disease, in addition to ALS (Lou Gehrig’s) and chronic traumatic encephalopathy (brain damage after head trauma). There appears to be a toxic buildup that tracks with the disease progression. They have weird names like beta-amyloid and tau protein. Of course, there are drugs being developed to stop their production, but more interesting to me is the recent discovery about sleep in an article by the Nat’l Institute of Health (2). “Beta-amyloid disappeared faster in mice brains when the mice were asleep, suggesting sleep normally clears toxic molecules from the brain.” You have heard of the cardiovascular system for blood and perhaps even the lymphatic system for body cell debris, but now there is the “glymphatic system” that cleans waste and toxins from the brain cells. This was discovered by researchers at the University of Rochester Medical Center in New York (3). They found as the brain’s cells “shrink” during sleep – by as much as 60 percent, this brain-cleaning system is 10-times more active. Maybe lack of sleep is why teenagers appear to have brain damage. The research was only done in mice, so we can’t be positive this happens in humans, but it seems logical and likely. But seriously, the action step to take from this is, “We need sleep. It cleans up the brain,” said Dr. Nedergaard, the lead researcher. 8-10 hours per night is a good range for almost everyone. If you regularly need more, you are likely sick, nutrient-deficient, toxic, or have a fatigued adrenal gland. This seems a good place to discuss naps and sleep’s effect on learning. So, do you think naps are good, bad, neutral? John Medina, in a very good book called Brain Rules (4), shares great insights to how sleep affects us. A recent study(5) showed that, after learning something new, children retain 14-25% better after sleeping overnight than they do during the same time of being awake during the day. It is recommended that children in pre-school sleep between 11-13 hours a night, school-aged children between 10-11 hours of sleep a night, adolescents about nine hours a night, and adults 7-9 hours per night. Some people are genetically blessed to needs less sleep by being able to sleep more efficiently. But when the rest of us sleep too little, consistently, we are not giving our body down time to recover. Heart surgeon, Dr Oz, says the number one best way to keep your growth hormones high is to get good sleep. What’s special about growth hormones? Well, more muscle mass and better skin are two big factors. So, sleep good equals look good. Dr Oz also notes the cycle of depression and insomnia. Those who don’t sleep get depressed, and those who are depressed get insomnia. Another motivating reason for good sleep is that it may help you lose weight and prevent diabetes. Dr Michael Breus wrote a book on sleep and health where he says that sleep deprivation lowers your metabolism and increases your appetite, especially for high-carb and high sugar foods. That is when we sleep too little. When we sleep too much or when we sleep the right amount of time but still wake exhausted, we are either going through a restoration phase for a day or week or month, or our sleep is not quality sleep. Lack of quality in our sleep may come from poor health or other triggers. The trigger for poor sleep may come from your physical environment, your relationships, or your body, but the biggest trigger for poor sleep is your mind. You may have started to wonder if there is any hope, or you may wonder if the commercials are right about you just needing more medication. 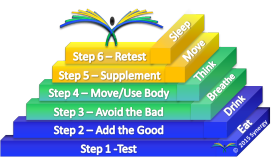 Sleep problems are part of the 6 Elements of Health that are highly modifiable. Here’s another great article about sleep that you may be interested in: Why is Sleep so Important to Your Physical and Mental Health?